The Milwaukee M18 Jobsite Radio/Charger is the first charging radio to bring the power of Bluetooth to the jobsite, while delivering the industry's best reception and sound. The most advanced radio of its kind, the M18 Jobsite Radio/Charger features a Bluetooth receiver so you can stream rich, full sound wirelessly from over 100 feet away. Its unique battery charger allows you to charge any M18 battery without sacrificing reception or sound quality. For added versatility, a high-power USB port allows you to charge most portable electronic devices over 50% faster than any competitor. The M18 Radio/Charger's lightweight, high-strength design includes a reinforced roll cage for protection from weather and abusive jobsite conditions. The radio/charger also offers the industry's largest on-board, weather-sealed storage compartment to protect your small belongings and smart phones. The Bosch PS60-102 12V Max Pocket Reciprocating Saw Kit includes a tool that is designed to provide cutting for small spaces and tight corners. This efficient and effective unit is light, at only 2.6 Lbs., and compact, at 11.0-inch long. But it delivers a 0.57-inch stroke that can get cuts accomplished, and in small work areas. With a high/low temperature and over-current indicator and battery gauge, this tool is a must-have carry-along option for the toolbox. The kit comes with a 12V Max battery and a 12V Max charger, for long-running power. The Bosch GWS18V-45B14 18 V 4-1/2 inch angle grinder kit pairs the ideal cordless grinder for pros who need unleashed performance and the CORE18V battery the best-built battery on the planet. With its four-brush motor design and optimized gear structure, the GWS18V-45 grinder produces 10,000 no-load RPM. It features a two-position vibration control side handle for better handling. It is designed for long life, with overload protection and lifetime brush design. The CORE18V 6.3 Ah battery provides more power than the previous-generation batteries, delivering performance comparable to competitor batteries that are up to 35% larger. It features CoolPack 2.0 technology for longer battery life, and it is backward and forward compatible with all Bosch 18 V tools and chargers. The included Bosch BC1880 18 V fast charger can charge a spent CORE18V to 80% in 41 minutes. The M18 FORCE LOGIC CABLE Cutter Kit with 750 MCM Cu/Al Jaws delivers the fastest installation ready cuts. This open jaw, fully balanced in-line tool allows you to cut effortlessly in the tightest panels without looping. Featuring the best power to size ratio, this compact tool powers through 750 MCM copper or 1000 MCM aluminum 2X faster than the leading competitor. Powered by a Milwaukee POWERSTATE Brushless Motor and M18 REDLITHIUM 2.0 Battery this tool can make over 250 cuts per charge, delivering industry leading run-time and unmatched productivity. The kit includes a M18 2.0 REDLITHIUM Battery, Multi-Voltage Charger and Carrying Case. 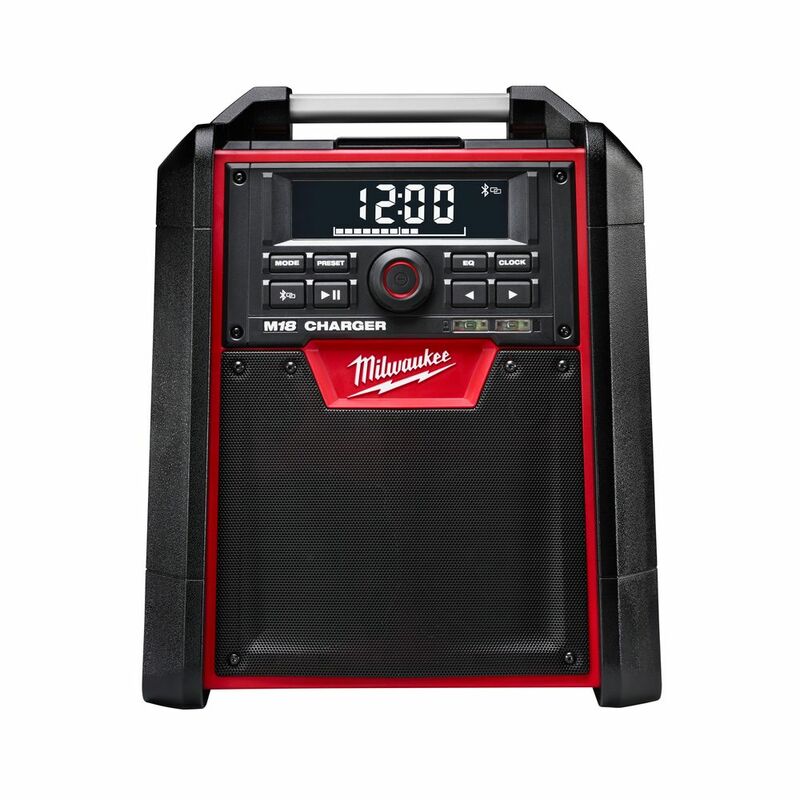 M18 Lithium-Ion Cordless Jobsite Bluetooth Radio and Battery Charger The Milwaukee M18 Jobsite Radio/Charger is the first charging radio to bring the power of Bluetooth to the jobsite, while delivering the industry's best reception and sound. The most advanced radio of its kind, the M18 Jobsite Radio/Charger features a Bluetooth receiver so you can stream rich, full sound wirelessly from over 100 feet away. Its unique battery charger allows you to charge any M18 battery without sacrificing reception or sound quality. For added versatility, a high-power USB port allows you to charge most portable electronic devices over 50% faster than any competitor. The M18 Radio/Charger's lightweight, high-strength design includes a reinforced roll cage for protection from weather and abusive jobsite conditions. The radio/charger also offers the industry's largest on-board, weather-sealed storage compartment to protect your small belongings and smart phones. M18 Lithium-Ion Cordless Jobsite Bluetooth Radio and Battery Charger is rated 4.5 out of 5 by 447. Rated 4 out of 5 by Musiclife from This stereo is very functionable in a small production room that holds 2 lines of frozen pizzas b... This stereo is very functionable in a small production room that holds 2 lines of frozen pizzas being packaged and boxed for shipping to retail stores for sale to customers. This is the second radio I bought specifically for job use. The first one we couldn’t even hear at all with lines running. The Milwaukee radio has a very clear and loud sound to it. And having Bluetooth is great! We can take turns allowing everyone else play music through their phones and such, allowing us to have a wide variety of music all day, everyday! Rated 5 out of 5 by Doc from It can charge m-18 battery has blue tooth very well... It can charge m-18 battery has blue tooth very well built. Will the radio run off of a battery? So when it's plugged in It charges the battery but when it's not plugged in it will run off of the battery?